WOW its a beautiful day here. Compared to yesterdays snow its now back to spring!!!! Im so confused with the days just now. I almost forgot to post this card. This week on Sketch Saturday we are sponsored by Bugaboo. 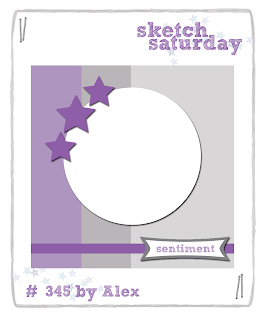 Its an anything Goes week so I have picked Sketch #345 from 24 Jan 2015. I love Bugaboo Images for the quickness of colouring. They are so cute as well. This card is for the Christmas Box. I hardly have any made yet for that time of year!! ARGH!!!! Digi Used - Winter Trio. Thanks for dropping by today. Im off now to enjoy the quiet. Jakes working and Tom is off to Edinburgh on a Boys Brigade trip to Dynamic Earth. Crafty Hazelnuts Christmas Challenge - Anything Christmas Goes. Starz Stamps - Weather Related. ABC Christmas Challenge - I is For Ink. I Love Promarkers - Pastel Colours. Great card Hazel. I love Bugaboo images and this one has been coloured so beautifully. Absolutely adorable!!! Love the snowmen, and all the added touches on your card :) Thanks so much for playing along with us at CRAFT this week! Lovely card Hazel, my Christmas stuff is still packed away !!! Such a super fun sentiment! !Love the image. Absolutely adorable! Fabulous Festive make Hazel - love the cute Snowmen and brilliant sentiment.